Rich in history, All Saints Church, Cranham is recorded from as early as 1254, and although the building has changed several times it remains on the same site. From 1254 the advowson of Cranham Rectory passed with the lordship of the manor of Cranham Hall until 1830 when it was sold to St John’s College, Oxford, where it has remained ever since. The last resident landowner and leaders of parish life on the site were the famous General James Oglethorpe (founder of the state of Georgia, USA) and Mrs. Elizabeth Oglethorpe. The first recorded Rector of the parish was John de Wokydon in 1310 and since has been transferred through many people in accordance with the lord of the manor. 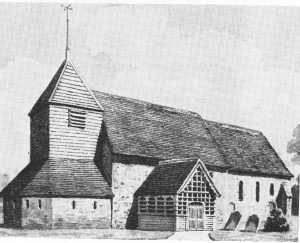 The church at this time comprised of a nave, chancel, south porch and short porch and short weather boarded west tower. There were three narrow lancets on each side of the chancel with the easternmost window on the south wall being shorter to make room for a rounded headed doorway. In 1638 the high pew was ordered to be removed from the chancel, and in 1702-3 the north side of the church was ‘ripped up and newly piled’. However by 1871 the church was said to be ‘in a miserable state of dirt and dilapidation’ and was thus rebuilt between 1873-5 in its present form. The present All Saints building was designed by Richard Armstrong and was funded by the then owner of Cranham Hall, Richard Benyon, to the cost of £5,114. It was built of stone in the early English style and consists of chancel, nave, south porch and north tower. Of the monuments that were retained from the old church, the marble tablet to General Oglethorpe (d. 1785) was replaced on the south chancel wall. In the chancel floor were set a brass inscription to Nathan Wright (manor owner 1647-1743) dated 1658 and a floor slab to his daughter Susannah (d.1664), successively the wife of Charles Potts and Francis Drake. The three bells (dated 1640) were re-hung for chiming only and the church plate includes an undated silver cup of the period (1696-1729) which was presented by the rector John Woodroffe in 1745 whose tomb stands just to the left of the church path. General James Oglethorpe, owner of Cranham Hall Manor, together with his wife, was laid to rest in a vault in the chancel above which stands a memorial inscription. Such is General Oglethorpe’s eminence that in 1925 his remains were requested to be moved to the Oglethorpe University, Atlanta, USA, however this request was refused. Links were forged between All Saints Church and related organisations in Georgia USA that resulted in the church receiving altar rails and choir stalls from the ‘National Society of Colonial Dames’. In 1982 representatives from the state of Georgia presented a plaque representing the 250th anniversary of the colonies foundation by Oglethorpe. The links forged with America are still maintained today. All Saints’ Church, Cranham with its considerable history, remains to this day an integral part of both local community life and international life, with its links to the city of Savannah, Georgia, USA where a nine-foot bronze statue of General James Oglethorpe stands guard over the main square. The church’s imposing tower and graceful spire remain a landmark for many miles around.